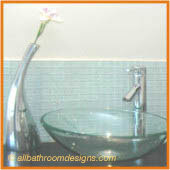 The Bathroom tile design ideas illustrated on this page are especially aimed at using tiles to achieve a desired effect. Rather than blending into the background, the tiles themselves play an important role in the bathroom design. Once you've taken a good look at the room as a whole, it's time to decide which areas deserve special treatment. Quite often the vanity will be the focal point in the room, so set the scene to show it off. 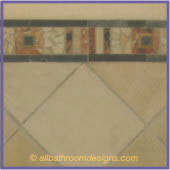 A slightly darker tile with a matching border on either side is used in a narrow band from floor to ceiling. 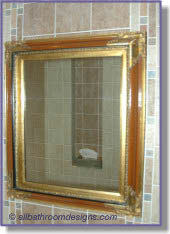 The same slightly darker tile is used in the niche, as can be seen reflected in the mirror. Where lighter color comes forward, the darker tile recedes, visually adding more depth to the niche. The change in color is not overly dramatic, but the effect is notable and pleasing. It's up to you to use the best bathroom tile design ideas to achieve your desired effect. 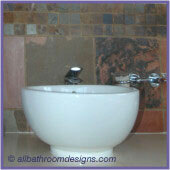 Because of the strong color contrast and pattern, you cannot miss the accent border tile around the vanity slab. 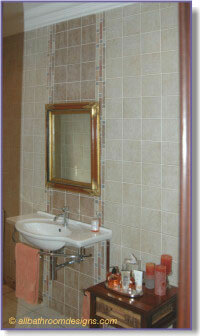 The border tiles around the mirror are secondary, blending in with the bathroom wall tiles, but still providing a point of interest around the mirror. The border tiles in this bathroom make no excuse for their color or proportion. They are there to draw attention! 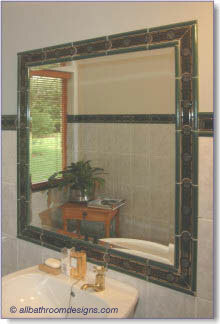 Being used as an edging tile and to frame the mirror, they actually become the primary decorating element in the room. Mirrors are great to add to the illusion of space in any room. They should not be used indiscriminately though and their placement should be carefully considered. Having a mirror opposite a toilet or showing a toilet in the reflection is not such a great idea - easily avoided by placing both on the same wall for example. 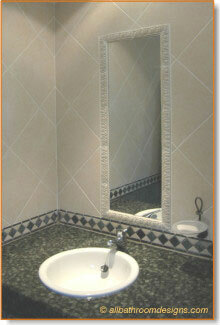 Please refer to our Bathroom Tile page for many more Bathroom Tile Design Ideas.